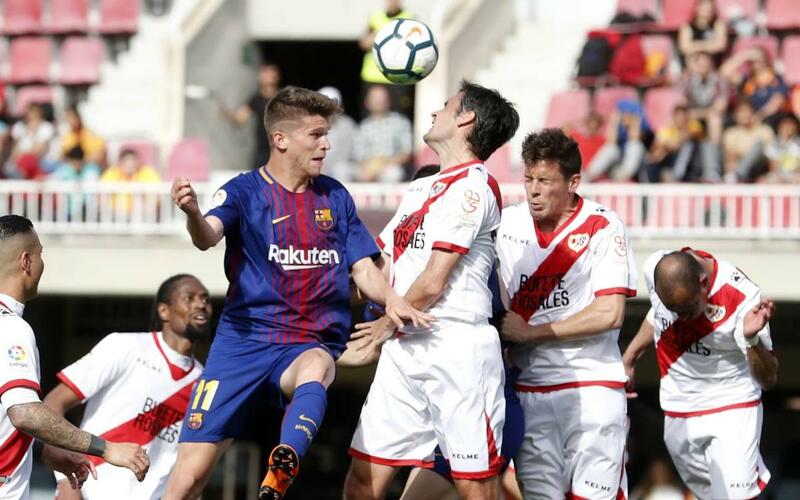 FC Barcelona B came close to mounting a comeback from two goals down at home to one of the frontrunners in Division Two, Rayo Vallecano, but ultimately had no points to show for a fine battling display that leaves them third from bottom in the table with six massive games left to play. Raúl de Tomás excelled in attack for the madrileños and it was he who converted the only goal of the first half from the penalty spot. The blaugrana went further behind after the restart when Bebé drove in a powerful free kick. But Gerard López’s side kept soldiering on and their efforts finally bore fruit. The 3,313 spectators in the Miniestadi were finally able to celebrate something when Monchu fired in from close range, leaving Rayo keeper Alberto with no chance. But Raúl de Tomás was always a threat and he finished a fine team move to pop in number three for the visitors. The reserves still refused to throw in the towel, and when Ballou Tabla scored from a tight angle with 12 minutes to go, there was at least hope that they might be able to salvage a point. But despite a dramatic conclusion to the game, thre was no further scoring. Next Saturday brings a huge game for Barça B as they visit fellow relegation strugglers Almeria at 4.00pm CET.